Posted on Tuesday, November 27th, 2018 by Lizzie Sarah Biddle. Norma was facing significant challenges. Her two young boys had both been recently diagnosed with autism, and she was struggling with serious health issues. With limited English, minimal support, and scarce knowledge of how to navigate health and social services in Greensboro, Norma felt isolated and alone. That is when Norma found Thriving at Three. This CNNC program is designed to build a positive foundation for Latino children in Greensboro, ages birth to 4 years, through supportive educational programming, home visits, and weekly group sessions. Norma joins other Latina moms every Thursday for Thriving at Three (TAT) group. During the weekly sessions the children and their moms participate in specialized programming, educational workshops, and other activities based on the Nurturing Parent curriculum. The curriculum is aimed at providing insights and tools to parents to promote positive growth and development for their children. Through the group, Norma has developed a sense of community. She is no longer alone in her struggles. She has made friends with other women also facing the challenges of raising their children in a new country. Thursday group has quickly become one of her favorite parts of the week. Despite the meetings, Norma was still having a very hard time at home. TAT staff made weekly home visits to help Norma develop better techniques to support her sons’ development. The TAT staff also connected Norma to another organization providing in-home services and support to children with autism. When Norma’s oldest, Axel, turned three, her TAT case worker assisted her with the application process for Head Start, the federally funded, early childhood education program. Axel now attends a local Head Start center and is learning socialization skills in a classroom setting that is helping with his autism. This has allowed Norma to return to work. Thriving at Three staff has also referred Norma to another CNNC program, the Immigrant Health ACCESS Project, to connect Norma to a consistent medical provider and help keep her healthcare costs low. 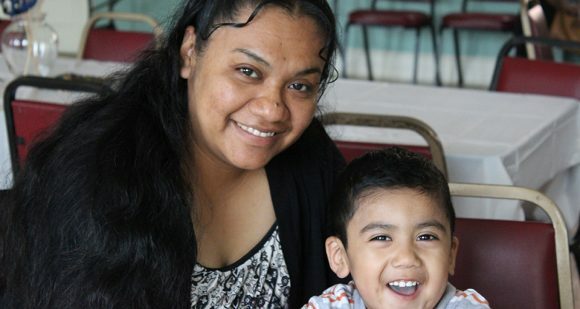 For mothers like Norma, receiving guidance and support from programs like Thriving at Three means being there for their children in the most meaningful way. Join us today, Nov. 27, in the global movement of Giving Tuesday and make your own impact on the lives of moms like Norma and children like Axel. A one-time gift of $25 allows us to do educational programming with the children during the weekly group. Thriving at Three is also seeking donations of children’s books and arts and crafts supplies. Thank you for your ongoing support during the month of November and our Giving Tuesday campaign! Read more about our Thriving at Three program and this year’s Thanksgiving celebration.